Mud Brick Vineyard and Restaurant on Waiheke Island must be one of the most popular places in NZ to celebrate weddings (and other special occasions). Those who can, including visiting celebrities with a bit of downtime, arrive by helicopter and walk through a path of lavender to the restaurant and tasting rooms which are made of the thick golden bricks that give the property its name and its charm. Looking back towards Auckland. Rangitoto Island in the distance. Just stunning. Shooting a new promo video for NZ featuring the Mud Brick. It’s not surprising that the Mud Brick has become something of a celebrity itself. On a recent visit, shooting was in full swing for a new Tourism New Zealand video. Cameras and cables and actors pretending to be waiters had overtaken the place and we had to duck and dive to stay out of the aerial shots being taken from the helicopter hovering a stone throw from the outside terraces. Don’t despair if your budget won’t cover a helicopter, the Mud Brick is a 35 minute ferry ride from downtown Auckland and a 10 minute taxi from the ferry terminal. Delicious food, wine tasting and breathtaking views will be waiting for you. 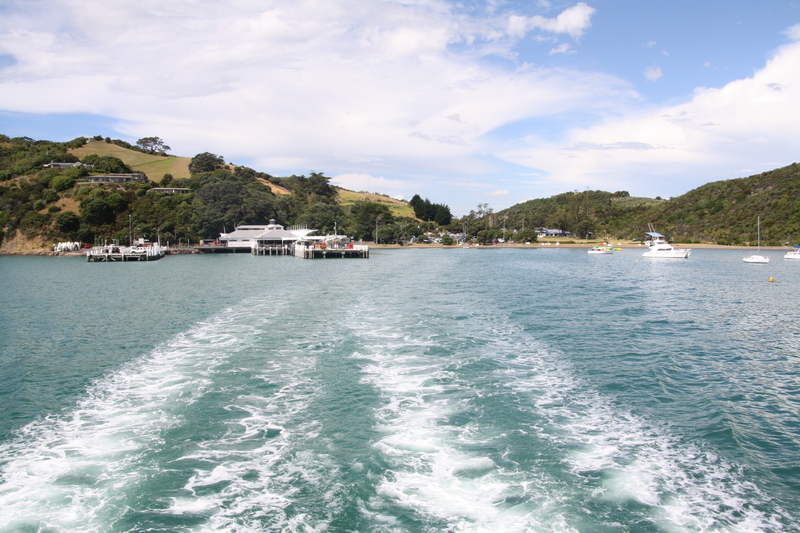 Leaving Matiatia Bay on the Waiheke ferry, Auckland bound. The Local Tourist needs no excuse to visit Waiheke Island. Other island stories that you might have missed: every 2 years Waiheke hosts an amazing outdoor sculpture exhibition. Read about it here. And then read some more about why Waiheke is wonderful.